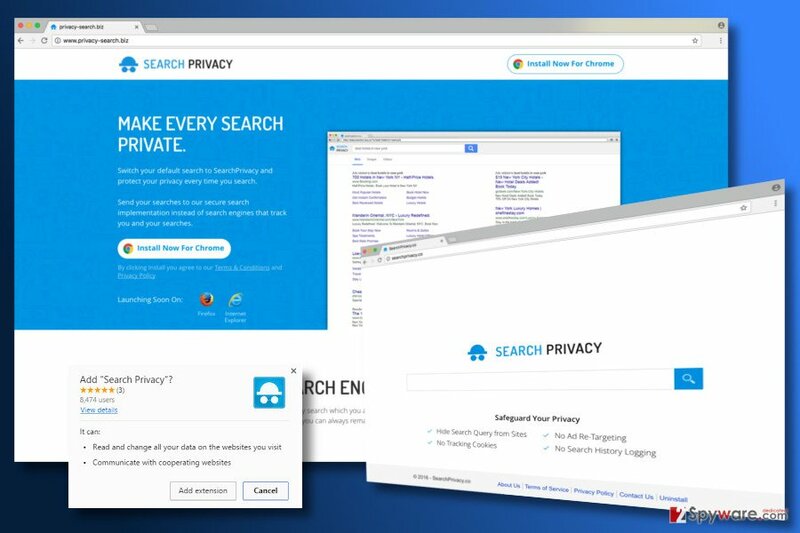 Privacy-search.biz is the PUP that uses misleading techniques to prevent removal. Use Reimage to locate malicious components and get rid of them faster than with uninstall instructions. A full system scan blocks virus reappearance and prevents traffic to malicious domains. There’s no doubt that the main purpose of the search engine is to provide relevant search results and help people to find necessary information. However, this search tool may not complete this task smoothly. 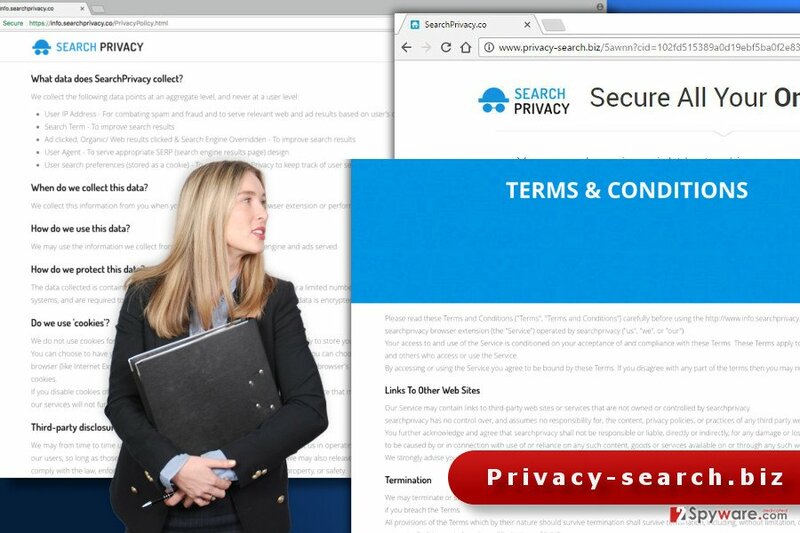 Lots of website owners and webmasters who want to increase traffic to their sites or promote particular products and services might take advantage of advertising possibilities offered by Privacy-search.biz virus. This PUP might include sponsored links into search results and display ads on each website you visit. Thus, you might be flooded with irrelevant commercial content, and face difficulties when looking for useful information quickly. However, you should be more concerned about Privacy-search.biz redirect tendencies. One click on ad or link might cost you a lot. Some of the sponsored content might lead to potentially dangerous sites, where you can be involved in an online scam or suffer from ransomware attack. Privacy-search.biz is a suspicious search engine that claims to protect online privacy. Nevertheless, users can install Search Privacy browser extension; it’s not the only way how it is distributed. We have already mentioned that this PUP spreads bundled with other software. Thus, you might find this search engine offered to download when installing various freeware or shareware. However, Privacy-search.biz hijack might be unexpected if you still rely on Quick/Recommended setup. We want to remind that these settings do not disclose about additional third-party apps that are offered to download as well. However, if you use this setup, you give indirect permission to install all additional applications. If you want to avoid potentially unwanted programs, you need to get used to installing software under Advanced/Custom settings and check each step. If you rush, you may overlook the pre-selected list of optional programs and unintentionally install Privacy-search.biz browser hijacker or other PUPs. Thus, be careful and opt out all additional programs. The fastest method to remove Privacy-search.biz from the device is to rely on the security program. All you need to do is to run a full system scan with a professional anti-malware/anti-spyware. It will find all hijacker-related entries and deletes them within several minutes. Then, you just need to reset your web browsers and set your preferred search engine as default one. Additionally, you can investigate the system on your own. Our prepared Privacy-search.biz removal instructions will help you to get rid of the virus manually. However, we want to point out that attentiveness and patience are necessary for this task. If you leave some of the hijacker-related components, this suspicious search engine remains on the browser. Follow the instructions below to remove Privacy-search.biz virus from the device entirely. Please, attentively perform each of the step and uninstall all suspicious programs that might have been installed on your device. Here, look for Privacy-search.biz or any other recently installed suspicious programs. Follow the steps below to get rid of the browser hijacker entirely. Wait until you see Applications folder and look for Privacy-search.biz or any other suspicious programs on it. Now right click on every of such entries and select Move to Trash. When in the new window, check Delete personal settings and select Reset again to complete Privacy-search.biz removal. Once these steps are finished, Privacy-search.biz should be removed from your Microsoft Edge browser. 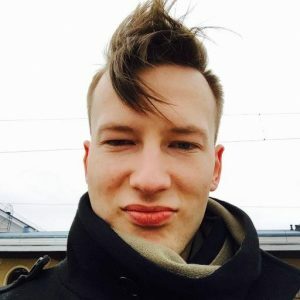 Go to the list of Mozilla’s extension. Look through it and delete all suspicious browser extensions. One of them is definetely Search Privacy; however, there might be other PUPs too. Thus, remove them all and reset tehe browser to delete all hijacker-related components. Here, select Privacy-search.biz and other questionable plugins. Click Remove to delete these entries. Now you will see Reset Firefox to its default state message with Reset Firefox button. Click this button for several times and complete Privacy-search.biz removal. Open the list of Google Chrome extensions. There look for Search Privacy and delete it. Moreover, you should look up for other unknown extensions, plugins or add-ons, and delete them as well. Laslty, reset Chrome as shown below. It helps to remove all hijacker-related entries. Here, select Privacy-search.biz and other malicious plugins and select trash icon to delete these entries. Click Reset to confirm this action and complete Privacy-search.biz removal. Here, select Extensions and look for Privacy-search.biz or other suspicious entries. Click on the Uninstall button to get rid each of them. Here, look at the Homepage field. If it was altered by Privacy-search.biz, remove unwanted link and enter the one that you want to use for your searches. Remember to include the "http://" before typing in the address of the page. Now you will see a detailed dialog window filled with reset options. All of those options are usually checked, but you can specify which of them you want to reset. Click the Reset button to complete Privacy-search.biz removal process. ^ Adam Clark Estes. How Not to Protect Your Privacy Online. Field Guide. The website about latest news in IT industry and tips for safer browsing. ^ Behavioral Targeting. Know Online Advertising. All Information About Online Advertising. ^ Larry Loeb. Malvertising Grows by 132 Percent, According to Report. Security Intelligence. Analysis and insight for information security professionals. ^ Online Scams. FindLaw. Find Laws, Legal Information, and Attorneys. This entry was posted on 2017-04-26 at 01:42 and is filed under Stealing programs, Viruses. You can quickly scan the QR code with your mobile device and have Privacy-search.biz virus manual removal instructions right in your pocket. How did you remove Privacy-search.biz virus?